SHARP stands for the Safety Helmet Assessment and Rating Programme. It’s a scheme devised and funded by the Department for Transport (DfT, a government organisation) to help motorcyclists make a more informed choice when buying a helmet. SHARP was launched in 2007 with the aim of giving consumers clear advice on how to select a helmet that fits correctly and is comfortable. Secondly, it gives motorcyclists an impartial view on the relative safety of motorcycle helmets available to riders in the UK. Not everyone likes or believes in SHARP. 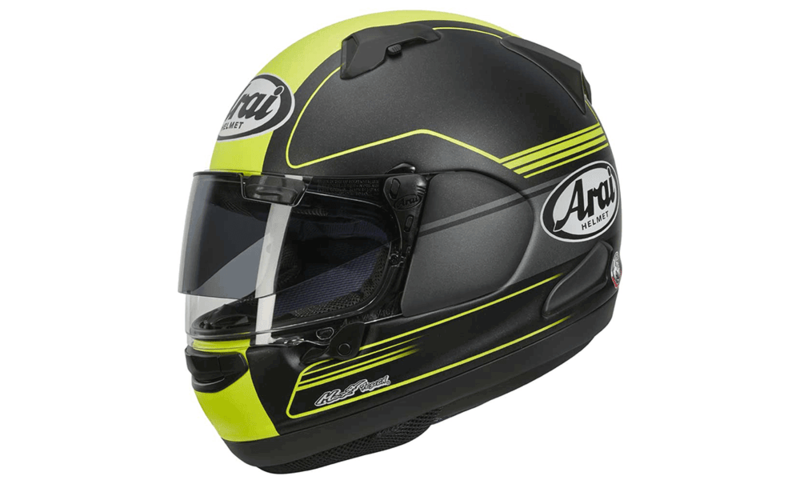 One of the biggest losers, when SHARP was introduced, was Arai – a brand that has always been known and a premium brand and well respected. Arai helmets didn’t score well in SHARP tests, leading some to challenge the legitimacy of SHARP. This challenge highlighted the rigidity of a SHARP test and how Arai lost points on some factors that many deemed were not vital to a helmet. The result? A split opinion. We all know that as motorcyclists, we’re vulnerable road users. We represent 1% of traffic but 19% of casualties. Significantly, around 80% of all motorcyclist fatalities and 70% of those with serious injuries, sustain head injuries. Research also shows that, statistically, head impacts are distributed uniformly around the circumference of the helmet. Research also highlighted that helmet detachment can occur during the accident sequence with reports indicating a frequency varying from 10% to 14% of casualties. Separately, there was concern that there may be poor knowledge concerning the best practice when choosing a properly fitting helmet. The temporal fossa (temple) is particularly vulnerable to injury and helmet design should provide more protection, and an increase in helmet energy absorbing capabilities of 30% would reduce 50% of the critical/unsurvivable casualties. Building upon this work, the DfT commissioned the Transport Research Laboratory to consider the potential to improve helmets to deliver this higher level of protection. The DfT also undertook a survey of helmets to understand the differences in protection that were available at that time. This revealed variances of up to 70% in the protective capability of different helmets at selected impact sites; reinforcing the need for a scheme, like SHARP, to provide consumers with objective advice. For years an ACU sticker, BSI kitemark or ECE 22.05 (when we joined the EU) had been seen as the benchmark for a quality lid but, like it or not, SHARP has set out to challenge this. They’ve ruffled a few feathers along the way but we think SHARP is a great addition to a motorcyclist’s arsenal of information. You might still stick with your favourite brand even though they don’t score full marks in a SHARP test but at least now us bikers have the knowledge to make a more-informed purchasing decision. Here at BikerRated, we think SHARP is a brilliant thing. However, if a £99 helmet gets a 5-star SHARP rating, then why would you buy a £499 helmet with the same rating? One of the main gripes the industry at large has with SHARP is that some manufacturers are accused of making helmets to pass SHARP’s test with higher scores. Why is that a bad thing? You may well ask. Because if a manufacturer makes their shell thicker in an area that they know is going to be impact tested, it may mean the helmet scores well in the SHARP test but it doesn’t necessarily mean the rest of the shell adheres to the same standard. The deeper answer is that although the protection and security for both a £99 and £499 helmet appear the same, there are many other factors not tested by SHARP. Aside from SHARP ratings, helmets generally range in price due to the materials they use (some are lighter, some just look flashy) and you pay a different price for a carbon-fibre helmet or race-replica paint job than you would for a fibreglass lid. Other features like a removable inner lining, removable cheek pads, sun visors, ventilation, anti-fog visors and different retention straps all affect the price. Can you put a price on comfort? Mostly, yes! Some helmets just aren’t comfortable, no matter what size head you’ve got. The cheaper brands tend to (but don’t always) have a harsher fit and feel – the linings aren’t as plush, they might not wear as well and the foam that makes up the protective inner layer might put pressure on your head where other helmets don’t. The thing about a helmet is that the fit and feel is different for everyone. You need to find a helmet that fits you comfortably and offers a good level of protection. Then you need to factor in the features you want and then the price you can afford. Then there’s also branding. Some ‘top’ brands sponsor racers and have extensive marketing, which is factored into the price of a lid. The great thing about SHARP is that it’s rocked the apple cart and made people think twice about their helmet. Are you buying into a brand or buying into a safety score? It’s no good having a £99 5-star rated SHARP motorcycle helmet if it’s so noisy or so uncomfortable you can’t concentrate. One of the great things about SHARP is that it allows all manufacturers to work towards making helmets that exceed their previous standards. 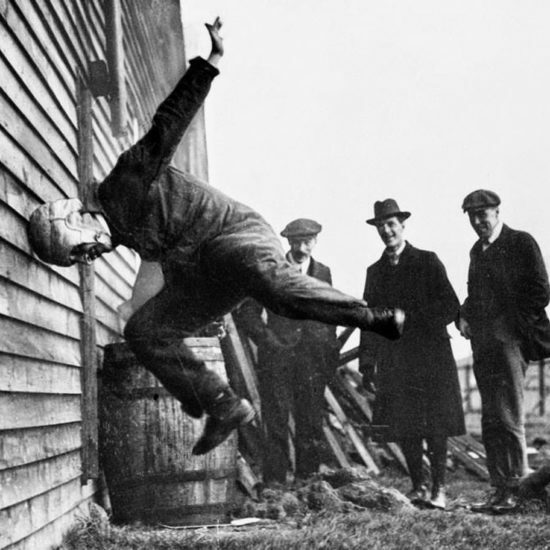 Testing American Football helmets back in 1912. Merica! SNELL is essentially the American version of SHARP. The tests have many similarities but many regard the SNELL test as being stricter. SNELL was established in 1957 following the death of William Snell, an American sportscar racer who died following an accident where many thought a better helmet would have prevented him from losing his life. SNELL covers car racing and motorcycle helmets. You won’t find many helmets being sold in the UK with a SNELL rating. If you buy-in to SHARP’s ehtos and just want the cheapest SHARP 5-star rated helmet, then look no further. For our money, we’d throw in the extra quid and go for the HJC IS-17, which has a recommended retail price of £159 but you can grab one on SportsbikeShop for just £119. With a removable washable lining, anti-fog visor ad internal sun visor, it’s great value for money and quality for the price.